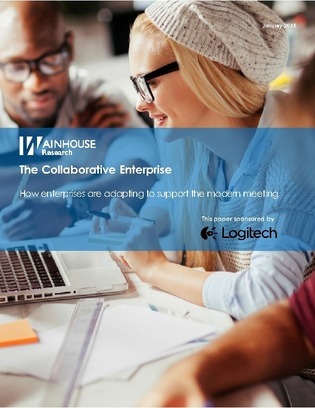 Wainhouse Research fielded an online survey to capture the pulse and quantify what is changing in regards to the way we work and the role of collaboration within today’s enterprise. 1. Modern meeting = high volume. The average respondent attends 9.3 meetings a week. 2. Modern meeting = virtual, visual, and anywhere. On average, 54% of meetings include remote participants. 3. Workplace transformation = collaboration. Results how ongoing growth of teleworking, flexible seating, and small workspaces.